Vital Enterprises is a company based at the Runway Innovation Hub in San Francisco. The company was founded in 2013 with the original goal to pursue healthcare applications of the newly emerging Augmented Reality smart glasses technology. Upon digging deep into the many possible applications of smart glasses, Vital Enterprises shifted its focus to industrial sectors such as manufacturing. We recently spoke with Ash Eldritch, Vital Enterprises’ CEO and co-founder to learn more about how Vital Enterprises enables modernization for its enterprise customers. RUNWAY: Ash, please share a high-level overview of Vital Enterprises. VITAL ENTERPRISES: We build a software assistant that sits on a smart glasses platform. 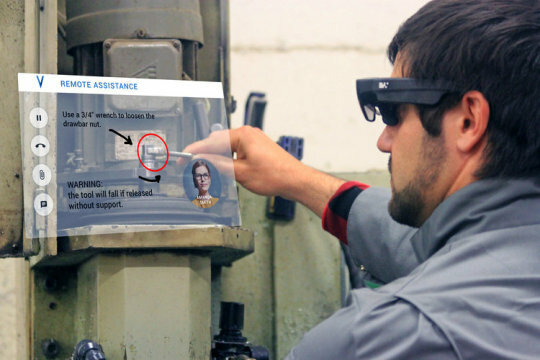 The smart glasses are worn by a technician who is performing some manual task. Our software brings in all of the information, team support and digital tools that they need. We provide heads-up work instructions, and instant access to expert support via Virtual Presence, enabling technicians to get their jobs done more accurately, to complete that task at a higher level of quality and to complete tasks that require high levels of skill. So our goal is to bridge the skill gap where there is a lack of expertise. We like to say we’re giving technicians superpowers. RUNWAY: Please describe use cases for Vital Enterprise software. VITAL ENTERPRISES: Manufacturing is a good example where we help our clients address some pretty critical issues, including the huge cost of human error and the lack of efficiency in many areas where you are relying on some pretty archaic tools, such as old databases and paper work instructions. 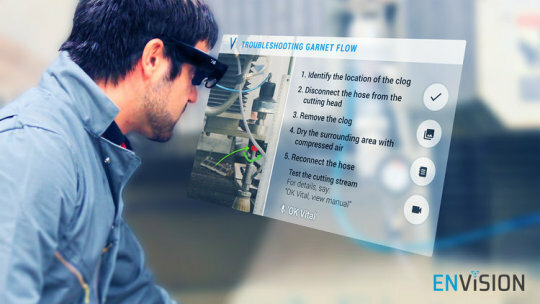 Use cases range from a trainee who is receiving instructions on their glasses whilst working on a manufacturing line, to a field technician who is performing some repair or maintenance tasks in the field. Our software can guide repairing equipment, safety procedures, training, and instructions. We help anywhere technicians working with their hands or doing something complex where they need to be operating at a high level of quality, effectiveness and efficiency. Other examples include aircraft inspections, wind turbine repair, safety checklists for mining equipment, and construction site surveys. There are hundreds of other use cases and we’re discovering new ones every time we meet a new customer. RUNWAY: Help us understand the evolution of smart glasses technology. VITAL ENTERPRISES: What we realized early on (2013-2014) was that the market readiness for this technology, as well as the state of the art of the technology itself, just wasn’t there yet. The hardware needed to catch up with both the vision that we all have of where this could go, but also with the needs of somebody who is going to be wearing this in an industrial setting for an entire shift. The level of comfort was limited because of the sheer weight of earlier versions. The glasses themselves would cut off your periphery, so your vision was fairly limited both by the field of view of the screens, and by the fact that you had all of this computing blocking parts of your peripheral vision. Things like the economics of the glasses, battery life, network connectivity also needed to be improved. With smart glasses, you’re trying to put the future onto someone’s nose. Over the last few years and several generations of iteration, smart glasses manufacturers have been able to make them smaller and lighter, extending the battery life, expanding the field of view; all of these improvements have been great. Smart glasses have come a long, very long way. RUNWAY: What is the state of smart glasses today? VITAL ENTERPRISES: It’s really been just in the past year or so that smart glasses are truly robust enough for industrial manufacturing applications. Today, smart glasses provide the ability to be truly hands free while you’re working, the ability to have your instruction always in view when you’re working and the ability for us to leverage the point of view camera to enable a remote colleague to see what you’re doing. Those are all massive advantages over something like a desktop or even a tablet - any kind of handheld device. We’re also now seeing a nice alignment with better market readiness and awareness by industrial sectors of what this technology is and how it can be beneficial. RUNWAY: Is Vital Enterprises also in the hardware business? Do you make your own smart glasses? VITAL ENTERPRISES: The glasses are a critical component of what we do, but we honestly wouldn’t dream of building our own hardware. I know a handful of companies that have done that. It is an enormous investment cost and you would be competing against companies that are literally pulling a million dollars a month into R & D. I think Microsoft spent two billion dollars in 2017 on the HoloLens, for example, just in terms of R & D. There are about 30 companies building hardware right now. RUNWAY: From where do your customers obtain their smart glasses? VITAL ENTERPRISES: In almost all cases we basically offer the hardware and the software as a bundle. We mostly do that as a convenience business model. But we want to be a complete solution for all customers. Some customers come to us and say, well, we already have the glasses. RUNWAY: And if customers are already using smart glasses, is that compatible with your software? VITAL ENTERPRISES: Yes. And quite frankly, it’s better for us if they are already using smart glasses. Some of the smart glasses brands we work with include Epson, ODG, which is a San Francisco based manufacturer, Vuzix, and RealWear as well. RealWear has a fantastic device that’s built specifically for industrial applications. It has no buttons, which makes it 100 percent voice controlled and it does a fantastic job of that. We aim to be a complete solution partner because the customers that we go into tend not to have worked with this technology before given that it’s so new. RUNWAY: Please share an example of a problem presented to you by an industrial manufacturing enterprise customer. VITAL ENTERPRISES: We have a multinational customer that is an Italian-based company that manufactures CNC machines, which are room-sized wood cutting machines. These are multimillion dollar machines which go onto their customers’ plant floors to manufacture furniture, for example. Every time one of those massive machines breaks down, you have two problems. One - you are immediately halting production, which costs the company money for every minute when they’re down and not producing. Two - then you’ve got to send someone onsite. Expert support is provided by a technician traveling down to the site to diagnose the problem. If that technician doesn’t have the expertise for that particular problem, then they send in another expert. However, for every industry that we’ve gotten into so far, the experts are getting aged out of the workforce and they’re not being replaced. The nature of the work is getting more complex, as everything gets more complex in general. And so we’re in a situation where the customer sometimes has to wait days to get that machinery back online. Our Italian client started rolling out our tech to their field service teams. That means that when a technician goes on site, they can instantly get access to several experts, and the experts can stay where they are. The experts are typically folks who have been around for a lot longer. They have families, they’re more likely to want to stay put and not have to get on a plane every time a problem occurs. Our work with this client resulted in a significant reduction of expert technician travel costs and increased satisfaction for our client’s manufacturer customers. Our work with Coca Cola provides another use case example. Their bottling lines run something like $24,000 a minute. And so when one of those lines goes down, obviously each minute means $24,000 dollars of lost revenue potential. They were able to use our software to get experts at the manufacturer of these bottling lines looking through the eyes of one of the line operators, and get repairs done rapidly without ever sending someone to the bottling site. By their estimates, Coca Cola saved hundreds of thousands of dollars with their first usage of the technology. As we spent time with them, we found that they have things like bottle change over procedures, which are frequently problematic and costly. You’ve got to change from a two liter bottle to a one liter bottle, for example. That is typically done by a junior technician - and they frequently screw up. We anticipate that providing step-by-step checklists to the operator, plus oversight from a remote senior technician, will dramatically reduce the frequency of these technician errors. RUNWAY: As your experience working with enterprise customers deepens, what are some of the new capabilities your team is excited about. VITAL ENTERPRISES: Being able to capture tacit knowledge from an expert performing a task, is something that we’ve just introduced. We can record structured work instructions including videos, photos and transcribed speech from someone actually carrying out the task while wearing the glasses. We turn those into step-by-step checklists that then anyone else can start to use. This is tacit knowledge capture, which I think is a huge, huge thing that we’re going to start pushing more and more. When we start working with our customers on one of their problems, often, we then start to identify dozens more use cases with them. RUNWAY: What trends in this field are exciting you the most? VITAL ENTERPRISES: We believe that there are strong synergies that can be had with industrial IoT (Internet of Things) where this can be used to visualize in-place the data that is being generated from the machines and equipment that you’re working with. With the glasses, we can overlay all of this live data on your environment, to make you much more aware of what’s going on. We’re also starting to focus more and more on how AI (artificial intelligence) can start to take this technology to the next level. Rather than being a passive assistant tool, where you’re basically pulling specific information and instructions you need, we’ll actually be able to use AI to get a sense of your context, learn to understand the tasks you’re performing, to proactively deliver real-time data, guidance and support to you. That’s really exciting. I think you are going to see a lot more of that increasingly human-like and human-centric task support, especially from us at Vital Enterprises. RUNWAY: What should an enterprise customer expect when working with Vital Enterprises? VITAL ENTERPRISES: We are a total solution company. We partner very closely with every company we work with. We will take the time to understand their business and their challenges. We help them to identify areas where we can have a real impact and then we’ll also design studies to actually demonstrate the business benefit. We will identify real metrics that generally tie to bottom line cost savings or other ways they can generate benefits. RUNWAY: What is the degree of scale you can address for your enterprise customers? VITAL ENTERPRISES: Over the past five years, we’ve designed our solutions from the ground up for scalability. So we can gracefully scale to hundreds or even thousands of devices. That said, we advise our customers to roll out this novel technology in phases. We start with a pilot phase with somewhere from five to 10 users, tightly focused on a specific single use case. That typically takes two to three months. Then we go to a limited rollout, which can be anywhere from 20 devices to 50 devices - and that could be another six months. We’re learning lessons at each of these stages and we’re embedding the technology into day-to-day operations, getting people comfortable with it. A significant rollout is anything more than 50 glasses. This is where you start to realize very significant benefits at scale. Many of the companies we’ve worked with see an opportunity for this to ultimately scale out to thousands, and that’s going to happen over the next several years. RUNWAY: Thanks very much for your time Ash.